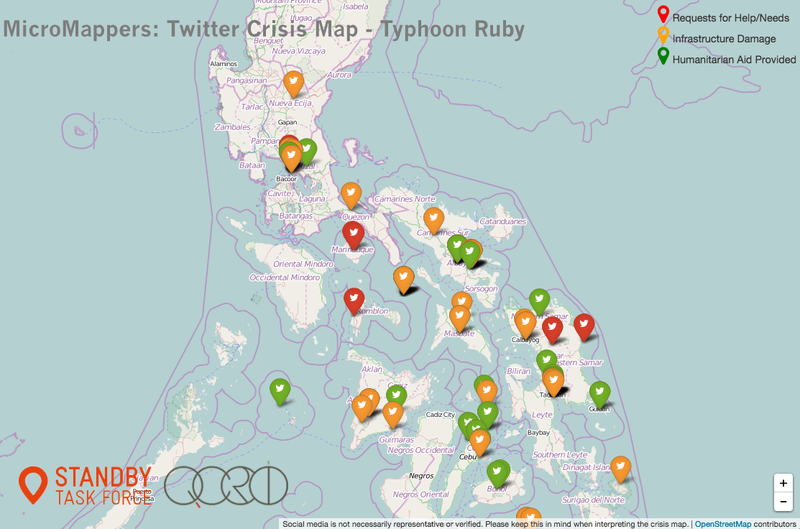 ← Calling All Digital Jedis: Support UN Response to Super Typhoon Ruby! 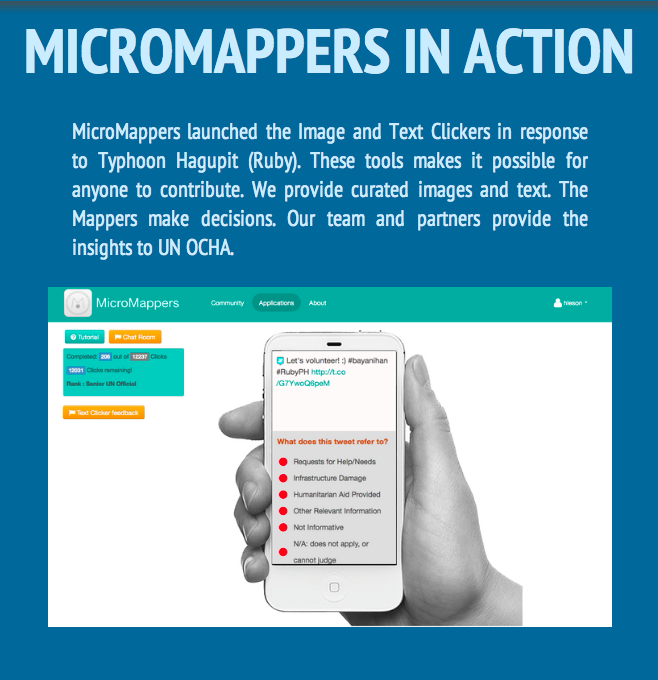 This entry was posted in Crisis Mapping, Crowdsourcing, Humanitarian Technologies, Social Computing, Social Media and tagged Hagupit, MicroMappers, OCHA, Ruby, Typhoon, UN. Bookmark the permalink. I am proud to have played a (very, very) small part in this success but would make a plea for improved UI for tablet (specifically iPad in my case) as this was very clunky at times and at other times didn’t respond at all. This was especially the case when working on place names and Palm tree images. I also found it frustrating that there were so many pictures of snow from (seemingly) North America but appreciate this is likely to be caused by keywords being picked up. Having said all the above, I fully appreciate that this technology is still relatively new and we are all somewhat feeling our way here. So, once again, proud to be involved and congratulations to the team as a whole on such an achievement. Many thanks Kevin, and thanks a lot for supporting these efforts, I really appreciate it. Please note that we have not offered MicroMappers via tablet or encouraged anyone to use tablets for MicroMappers. 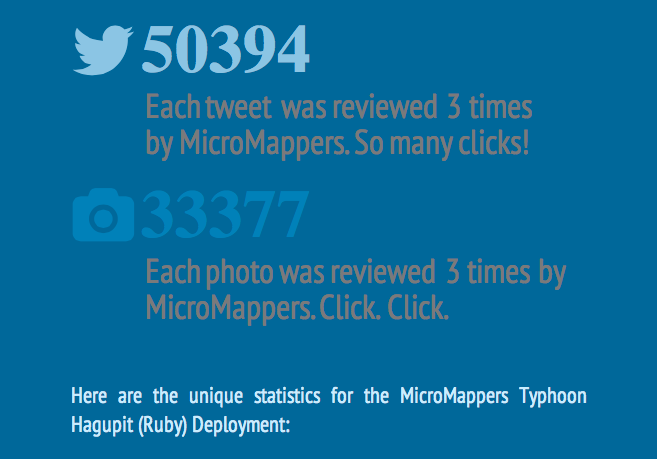 Please for now only use the MicroMappers via laptop/desktop. We’ve made this clear in the past and looks like we should continue emphasizing this, so thanks for your feedback. 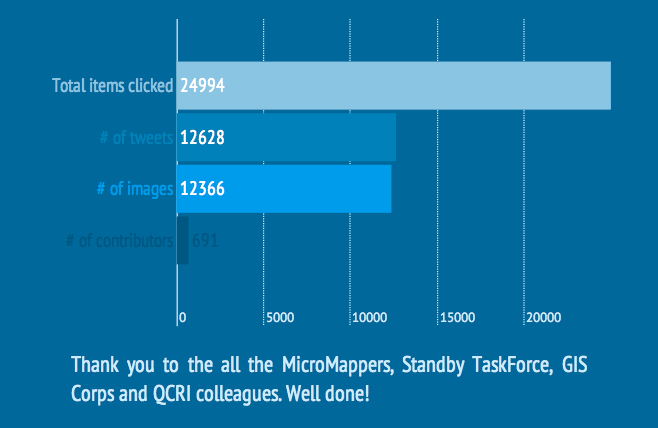 We simply don’t have the resources at the moment to develop tablet apps for MicroMappers. But if you know anyone who might be willing to create these, do let me know. Thanks again! Thanks for everything you and the DHN do! This is part of my research area and I presented a paper at UCFs Public Administration Research Conference on the DHN response to global disasters in March. It is now a book chapter here https://rowman.com/ISBN/9780739196946 Many thanks to you, Andrej, Dr. Starbird, and the wonderful people you bring together to make a difference in the worst of times.